Quiltville's Quips & Snips!! : En Provence Mystery Monday Link-Up, Part 1! En Provence Mystery Monday Link-Up, Part 1! As I’m packing up my bags in Key Largo and getting ready to head home, I have some fun to share with you from a group of quilters in Chandler Arizona. This is the 4th annual Quiltville Mystery they’ve kicked off with a party, door prizes, and CAKE as they sew together on clue one. This is the kind of party I would love to be invited to, wouldn’t you? The power and driving force of this event is none other than our Quiltville’s Open Studio moderator, Angela Neff. Would you look at this cake? HOW FUN is this?? And I love how the icing pulls in our magenta just perfectly. Paint chip party favor Christmas ornaments! People are always asking how this kickoff party thing got going so here is the story. Five years ago Kathy, Kathy, Becky, Barb and I got together on black Friday to sew at Kathy's house. We gabbed of our love of Bonnie as we all started the Easy Street Mystery. It was that small group sewing day that led to our actually throwing the first Quiltville Mystery Kickoff Party for Celtic Solstice the following year. Our group has grown every year and we now have forty two people who want to be invited each year and I am adding to the list as I find locals all the time! Not everyone can make it to the party but our original five try hard to be there (or stop in) every year. This year Kathy, Marguerite, Laura, BJ, Barb, Kathy, Celeste, Jill, Heather, Susan, Evelyn, Jen, Ann, Bonnie, Terri, Fran and me (Andee--Bonnie's #1 fan) were in attendance and Becky dropped in. Completed Allietare quilts from last year! Allietare quilts were completed by Kathy, Kathy, Marguerite, Andee (me), Laura, Barb, Evelyn, Bonnie and Fran and a few others who did not have them with or were not in attendance. I look forward to the parade getting larger every year as we encourage each other to finish these quilts that are truly works of art! The past 3 years of Quilty Mystery Fun! We are all so motivated by the parade of finished quilts each year and it is fun meeting new friends and seeing everyone's fabrics and completed quilts. We order a cake, have a potluck, have party favors (this year a paint chip with Bonnie's colors and a label for the completed quilt) and even door prizes. 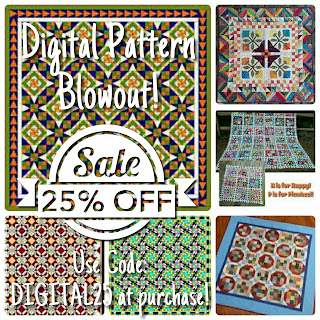 Previous Mystery Quilt Patterns ON SALE! 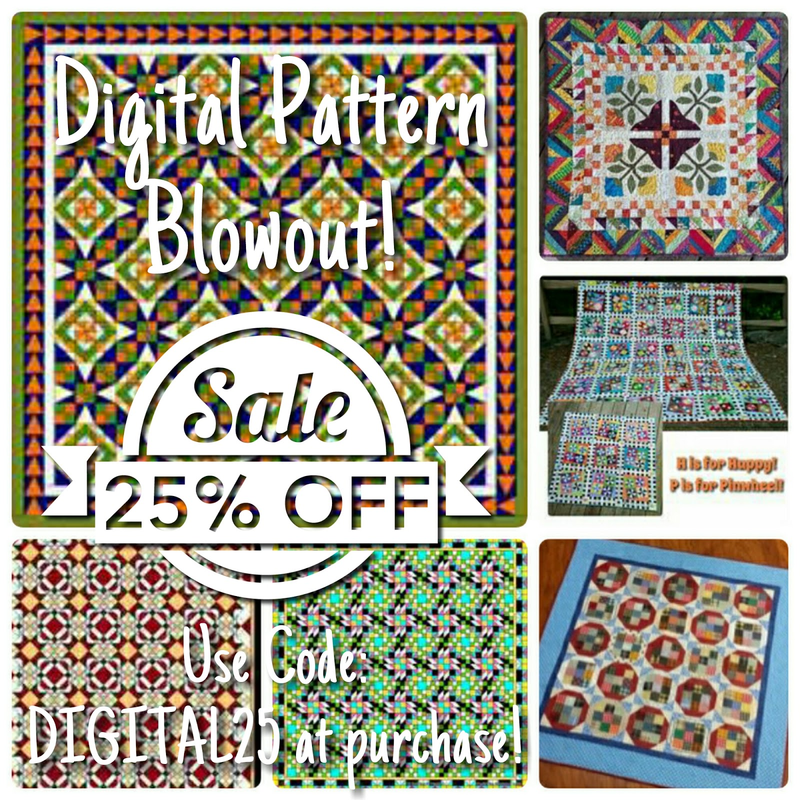 If you missed out on Celtic Solstice, Grand Illusion or Allietare, you can find all digital patterns on sale now at 25% off in the digital pattern section of the Quiltville Store until December 1st! Use coupon code DIGITAL25 in the coupon box when ordering. Code must be used at time of purchase. Label for this year’s En Provence Quilt! It is truly a terrific day and I wish each an every one of the mystery quilters could join us. One day we hope Bonnie is in town for Thanksgiving and she pops in on us! I would love that, ladies! Andee’s Allietare – great pose! A big shout out and thank you to the generous Bonnie Hunter for doing this for us every year! We truly love and appreciate that you do this for us and bring us all together. My best quilting friends are Quiltvillians! i am so excited that these kinds of activities are forming in different areas around the globe. Why sew at home when you can sew as a group?? And I’m extra excited that I’ll be seeing these gals in January when I head down to Arizona to teach for their guild in Chandler. January is a GREAT time to head to Arizona! If you are working on the msytery as a group, would you consider taking some photos and emailing them to me with your story? I'd love to share then here on our Mystery Monday Link-Ups! So let’s do this. For those who doin’t know how a Mystery Monday Link-Up runs, here is a bit of info. No matter where you are in your En Provence, you can share blocks, design wall photos, completed tops, quilted tops waiting for binding, finished quilts, quilts with your dog, cat or grand baby on it – just share! If you do not have a blog, you can link to an instagram post, google+ post, flickr photo or even a Pinterest photo. So be sure when you are filling in your information below that you include a URL to your specific post or photo, not just your main blog or profile address. We need the address of the page where your photo and post is, not the whole account. The linky pages will be alive FOREVER in the archives, Your link will stay there so people can find you, please link correctly to my post so people can find me and the others who have shared their links as well. Very important to know! Don't give up on yourself. Vintage triangles quilt shared by Kevin H.
Great story - I wish I was there! What a cool idea to do a parade with the finished quilts! They are all so beautiful. Can I join this mystery quilt? I love doing them. I am a first time Mystery Quilter. I have quilted some of the past quilts and I thought they were beautiful. Wow! Look at all those clue one pics. It's going to be gorgeous, Bonnie. squirrelie55 - anyone can participate in this mystery. Just go to the top of the blog and click on the tab labeled En Provence. There's a new clue every Friday. So thankful for your generosity Bonnie, and to Andee for all of the wonderful work she does with moderating the Quiltville FB page. I am going to go to this party one day to join them! I linked in this morning, but didn't have time to comment as my ride was leaving for work. Thank you for these yearly mysteries. This is my 4th one and I get better with each one. The suggestion for adding a second neutral to make the 4 patches worked really well for me. Thanks for keeping those of us who use stash yardage for the project. That is so cool! I have been to Chandler AZ many times. But my mom passed away last August, so I have no reason to go of a while. I'm just sewing and sewing. I sure wish I could figure out how to link my photos. Tried Pinterest and Flickr but can't make it work. 😔 I'm sure enjoying everyone's pictures tho. The linky tool has expired. I've just returned home after a nice long Thanksgiving holiday with family in Scottsdale. I'm so sorry for the grief and angst some rude, thankless people caused you, Bonnie! They are truly the broken ones. I'm grateful that you had a few days in the sun with your sweet hubby. Haven't been doing a lot of sewing lately as I'm packing my home to move to Arizona. Looking now at homes in Cave Creek. Wish I could see you in January, but I'm afraid my home sale won't move that quickly. My first mystery quilt with you, I'm a bit of a newbie. Purchased two books & your triangle tool. They're here, at ready! I did stop at Lowes to pick up my paint chips before I left for Thanksgiving. Been packing up my stash for the move but I did pull some fabrics. I was so busy enjoying and petting fabrics in the delightful colors that I haven't yet picked any neutrals so I'm running behind. Hope to find time and neutrals over the coming weekend and I can join you all next Monday. Today, I'm off to the dentist for a root canal under a crown... and a birthday party tonight. Quilts of valor sewing bee tomorrow. Thank you, Bonnie, for your creative & generous spirit. I look forward to many sewing adventures with you. Enjoyed your Facebook live session. My first time doing one of your mystery quilts. Have got 112 4 patches done so far and out of my sewn strips. Have to put more together. Hard to do at this time of the year since I have 2 quilts to quilt for Christmas presents that I have to get busy one. One should be easy a jelly roll that I am just doing serpentine stitch where the rows join. Another one is whole piece of fabric with fish, I may do a side to side pattern to look like water. Have to practice some first. Hi, I'm Cristina!!! I dont have a blog but I would love to do the Provence! :) Thanks for sharinggg!!! From Key Largo to Home! The Road to Key West! Sunshine & Sand Key Largo! Quiltmaker 100 blocks vol 14 DRAWING TIME! Showin' & Sharin' in Idaho! Pineapple Blossom in Idaho Falls! Texas Tumble Weed, Snake River Valley Style! Pat Sloan’s Teach Me to Machine Quilt Blog Tour! Quiltmaker’s 100 Blocks, vol 14 BLOG TOUR! Oh, Family Chaos and Happiness! How About a November Quilty Box Gift-Away! Sunday and a For Sale Sign. En Provence & The 3-in-1 Color Tool. A Bit of Clean & The Crown! A Bit of Pumpkin Play! A Bed Turning from the Barn!